On the same day that I saw the Year of the Rooster exhibit at the Met, I also decided to take a look at the Arms & Armor of the Islamic World exhibit. Most of my undergrad studies focused on Middle Eastern history so it’s an area I’m generally interested in. Plus, I grew up reading sword and sorcery fantasy novels like the Dragonlance series of books, the Lord of the Rings, and Song of Ice and Fire, among others. The Wheel of Time series is also pretty good. Anyway, seeing arms and armor in person isn’t as dramatic as those stories, or watching Game of Thrones, but it’s pretty cool anyway. 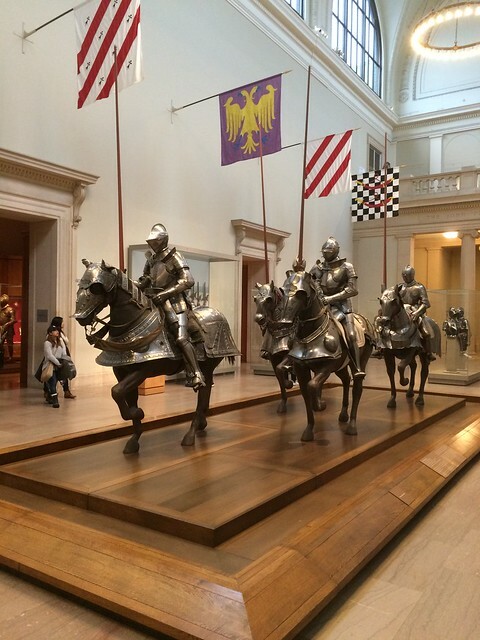 The Arms & Armor hall in the Met is one of my favorite exhibits. I was hoping the Arms & Armor of the Islamic World exhibit would be just as impressive. The exhibit consisted of a few items packed into one small room, along with a sign saying, “Oh by the way, there’s some other stuff scattered around the rest of the museum that generally falls into this category but we couldn’t be assed to actually put it all together into a coherent display for you, but wanted to get more people into the museum and get more money so we pretended to set up a full exhibit and put it on our website and brochures.” Or something along those lines. Disappointment in the size and scattered nature of the special exhibit aside, I took great pleasure in examining what was actually there and in looking at the regular items on display. Next time I head to the Met, I think I’ll go take another look at the Islamic Lands wing. I haven’t been there since shortly after I opened, in 2012 I think it was. While my wife and I were down in Georgia, it wouldn’t have made sense for me to not show her around Fort Benning. I did my basic training there in 1998, after all, on Sand Hill at 2/54 (2nd Battalion, 54th Infantry Regiment). After spending some time driving around Sand Hill, getting lost, using my phone to consult Google Maps and then finding our way back to the highway, we got over to the National Infantry Museum. Technically, it’s not on Fort Benning; it’s just out the gate in Columbus, Georgia. The National Infantry Museum at Fort Benning Georgia. I wasn’t really expecting much when we drove up to the parking lot. I’d heard good things about the NIM but I remembered how decrepit the old museum building was. I’d only gone there once when it happened to be closed and spent my time outside looking at the tanks. From the moment we walked up to the building entrance, though, I could tell the planners had put quite a bit of effort into making the NIM a place worth visiting. There was no fee to get in. That was a bit of a surprise. I guess I’m used to New York City, where every museum and art gallery wants to push you to the brink of poverty with their entrance prices, though those prices are usually just recommended donations, meaning you can give less and still get in. Anyway, there were donation boxes scattered around the lobby and we gave about ten bucks. Information marker stone in front of the eight historic battle recreations. The most visually appealing part of the museum is the ramp that stands directly ahead of the entrance. It takes you up through recreated scenes of eight famous battles that were decisively won by the infantry, from Redoubt #10 in the American Revolution to WWs I and II and up to the recent invasion of Iraq in 2003 (of which I was a part). There’s no Natural History Museum or any serious art galleries in Columbus, but having a military history museum available must be nice, especially considering that quite a few people in the area are military or military dependents (wife/husband/kids). While we were looking at the recreations, a man was walking up the ramp with what I assume were his sons, telling them about the battles and why they were significant. The kids looked really impressed. I wonder why it is that war is always such a hook for people (especially kids) when studying history? Behind the ramp of the eight historic battles was an area that had a lot of photos and videos about drill sergeants and infantry training on Fort Benning, called OSUT now, which stands for One Station Unit Training. Unlike other job specialties in the military, infantryman do all of their training in one spot, from beginning to end as one unit. For example, I wasn’t infantry, so while I did my basic training in an infantry training battalion on Fort Benning, I did my advanced training at Fort Lee, Virginia. Statue of mother and child left behind by soldier at war at the entrance to a small gallery about soldier’s families during deployments. After you finish looking at the training stuff, you can go down to the lower level and look at thematic galleries that address different periods, wars, or theaters of war. Those were pretty cool. There were a lot more artifacts there than I expected, the most surprising of which to me was Hermann Goering’s Nazi baton. Hermann Goering’s Nazi Baton, crusted in diamonds, presented by Adolph Hitler in February, 1938. The baton made me think about how these days you can’t keep anything you find on the battlefield. Now they call them “war trophies” and a soldier can face legal action under the military justice system for sending that type of stuff home. I don’t know why. If you’re going to ask soldiers to do something stupid for ambiguous reasons, you ought to at least let them keep a souvenir. Not that I think wholesale looting should be allowed, either, though. I suppose the problem of where to draw the line led them to think it would be better to ban it all together. Captured artifacts from the Philippines Insurrection and Moro Wars in the late 19th / early 20th century. I also enjoyed seeing the stuff from the war between America and the Philippines, which mostly revolved around fighting the tribes in Mindanao who refused to be subjugated. The information placards there indicated that the US eventually won that fight, though my wife disagreed and said that’s wrong, that those people were never conquered; they resisted the Spanish, the Japanese, the US, and even the national Philippines government. I think just recently the Philippines government had to grant them limited autonomy to get them to stop blowing stuff up. A POW – MIA memorial outside the NIM. A family member told me that a person could probably look through the entire place in about 4 hours, but I have to disagree. If we stopped to read and look at each exhibit thoroughly, we could easily spend two days there and not get bored. When we went, two of the galleries, the ones for the earliest periods of US history, weren’t even open yet. That would make the trip even longer. We wished we had more time to enjoy the museum, but we’d only set aside one afternoon of our vacation for the museum. We’ll have to go back again next time. A painting of a man leaving his family during the civil war. A recreation of the jungles of Vietnam at night. A mock spike pit from a recreation of the jungles of Vietnam.